Doctors group the different types of breast pain into three categories: cyclical, noncyclical, and extra-mammary. 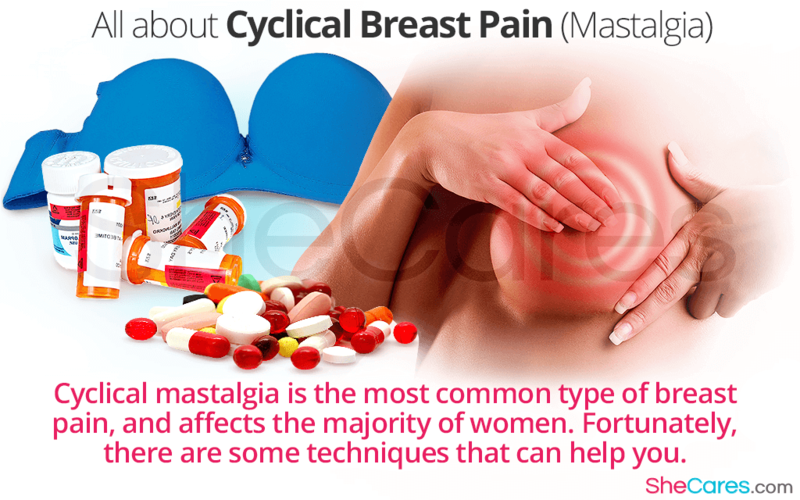 Cyclical breast pain - or cyclical mastalgia - is the most common type, and is thought to affect most women at some point during their life. The pain can present itself in various ways, at different times, but in general it is manageable. Read on to discover what causes this kind of breast pain, and how you might be able to stop or alleviate it. Cyclical breast main is specifically pain which arises with a direct correlation to the monthly menstrual cycle. Pain is usually at its worst 3 - 5 days before the first day of your period, and can vary from slight tenderness to more intense pain and aching. Unfortunately, for some women the discomfort can begin around two weeks before her period, and persist until the end of bleeding. Due to the presence of pain at specific points of the monthly cycle, it is widely acknowledged that the cyclical mastalgia is related to hormonal fluctuations. It is thought that the reproductive hormones affects the bodily tissue that makes up the breast, making it more sensitive which can result in tenderness or a sore sensation in some women. What Are the Symptoms of Cyclical Breast Pain? It might be helpful to keep a note of your personal symptoms on a chart or calendar, in order to identify whether you are encountering cyclical mastalgia or not. How Can Cyclical Breast Pain Be Treated? Obtaining well-fitting underwear. It is advisable to be measured professionally and take time to find a bra that provides adequate support and comfortability. This is particularly important for those who are considerably physically active. Consuming pain killers. Over-the-counter pain relief medication such as ibuprofen or paracetamol can be successful in alleviating or even eliminating cyclical breast pain altogether. Taking hormone-influencing medication. Because hormonal activity is the cause of cyclical breast pain, it can be advisable to look into administering or changing medication such as oral contraceptives, in order to lessen the pain. Cyclic pain in one or both breasts is normal, and unfortunately must be endured by the vast majority of women. Each woman's experience is likely to be slightly different, in regards to the type and intensity of pain, when it happens, and how it is best treated.